Churchill Nocturne Catering 2 Cup Sandringham Tea/ Coffee Pot . Churchill Nocturne design is one of their catering range.The tea / coffee pot is a 2 cup Sandringham shape. This stunning coffee pot from Royal Albert Songbird collection is in the pattern. Coffee pot does not look used. On the lid the colour has slipped during the production as per photo. NEW ROMANCE. 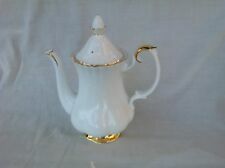 This beautiful coffee pot from Wedgwood is in the pattern. Holds approx 2 3/4 pints. 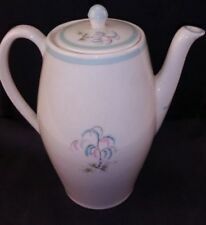 Biltons Blue Willow Tea/ Coffee Pot 6 Cup..
Blue Willow is a traditional pattern produced by many manufacturers in the Potteries. The tea/ coffee pot is produced by Biltons. A wonderful 1970's Empire Porcelain Staffordshire Pottery Orange,Black & White Coffee Pot. In good condition. Overall crazing as expected. This beautifully decorated coffee pot, lidded sugar bowl and creamer are from Queen’s China and is in the pattern MARIE Offered in excellent used condition. Only the lightest lightest signs of wear seen only on the closest of inspection. Coffee pot approx 8” high with lid. Creamer 3.5” high. Sugar bowl 3.75” high with lid. First quality items. Postage and packaging £4.99. Please note I post Tuesday - Thursday. Churchill Nocturne Catering Large Coffee Pot . Churchill Nocturne design is one of their catering range.The coffee pot is a large ( 1.5 Lt.) size. Base etched STAFFORDSHIRE TABLEWARE ENGLAND. PATTERN TEA / COFFEE POT, EXCELLENT. Royal Tudor Ware coffee pot for sale circa 1960's. This belonged to my aunt. All quite chunky and solid and doesn't seem to have been used much. New London Royal Tudor ironstone Symphonie design. This is the coffee pot. One Saxony Ellgreave Coffee Jug. Saxony Pattern. This delightful TALL coffee pot is from the retro period of the 1960's. This is tamped on its base IMPACT British Anchor Stafforshire England. The coffee pot stands 25 cm high and is 21 cm wide at its widest point. 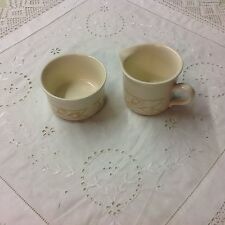 For Sale: a 3 piece coffee set manufactured in Staffordshire, the British Anchor collection. The pattern is called "Romance" and features a simple-yet-elegant black rose motif. The 3 piece set consists of: coffee pot, sugar basin, and milk jug. Condition: Excellent. Like new. A small, unnoticeable chip on the inside of the coffee pot rim. No other chips, cracks, or crazing. Thanks for looking and please check out my other antique and collectible items available for sale. All items wrapped to a high standard by experienced eBay seller with 100% positive feedback, so please trust that your items will arrive safely and securely. Please don't hesitate to contact me with any questions or queries regarding items for sale. 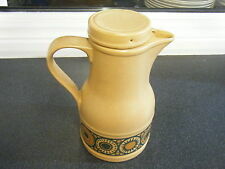 This rare retro coffee pot from Midwinter is in the pattern EVERGLADE offered in very very good condition. Light signs of wear seen only on the closest of inspection Approx 8.25" high with lid x 9" from handle - spout. First quality item Postage and packaging for £5.99. Please note I post Tuesday - Thursday. Vintage Barratts Pottery Blue Songbird design 2 pint capacity coffee pot. 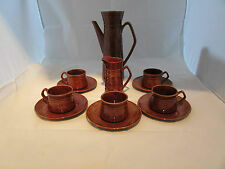 We have on offer a 5 piece royal tudor ware springtime coffee set. It comprises of 1 coffee pot, 1 milk jug, one sugar bowl and 2 cups. Some crackling to the glaze on the pot and possibly a very small chip to the lid but I think this may have been formed as part of the glazing process. Small chip to the base of the sugar bowl other than that in great condition. This stunning coffee pot from Wedgwood is in the pattern. BLUE PACIFIC. Item can be collected from our warehouse at Bull lane. This item is Used and in Good Condition. Staffordshire Oakwood Coffee Pot 1.320 Litre capacity - there are a few underglaze spots of paint on the very tip of the lid's finial and two pinholes on the edge of the flange on the lid. The pattern and glaze are bright. Ellgreave Tiko England Coffee service. Complete set. Beautiful honey colour striped coffee pot, milk/cream jug, sugar bowl, six coffee cans and matching saucers. With lid just under 11" (28cms). Coffee set comprises. Iconic tall coffee pot with lid. Sugar bowl. All pieces are back-stamped with the maker's mark except the saucers, which is normal for the period. Crown Clarence Staffordshire coffee or tea pot. Cream background with vertical panels of blue, green and orange with blue lid. Height approx 7” including lid.
" FERONA ". 900868 in gold. A Matching Coffee Pot With Lid, Cream Jug, Sugar Bowl & Six Coffee Set Duos. Cream glazed, smooth earthenware of good quality. Cream Jug height 3" / 7.5 cm. A desirable, tall slender coffee pot with a smooth rim, an attractive larger. Vintage Staffordshire Ware Barratts "ELIZABETHAN" coffee Pot. Small chip on the bottom (please see photos) otherwise vgc Dispatched with Royal Mail 2nd Class. Crown staffordshire coffee pot used but good condition. See pics for size. A J Wilkinson Coffee Set. A J Wilkinson. Coffee set. We fully understand that things can go wrong for a variety of reasons. Excellent overall. Honey glazed. Pitting around the rim on one side - see photos. Age related crazing. Very good condition without lid. Ridgway Staffordshire Pottery 'Indian Tree' Design Coffee Pot. Stunning coffee pot in excellent condition in 'Indian Tree' Design. Width: from spout to handle 16cm. From Crown Clarence, Staffordshire, England. 23cms (9") high. 7.5cms (3") high. 5.5cms (2") high. 9.5cms (3.75") wide. Arthur Wood & Son Purple Pansy / Violets Tea Pot Staffordshire 6496 c1954? Colour – white with background purple pansies / violets and gold edge detail. Staffordshire, England. Arthur Wood & Son. No visible wear / or scratches. Underneath says.